Ginger is a herb with medicinals qualities that is used as a spice. This underground stem can be used fresh, powdered, dried, or as an oil. Native to Ginger is native to southern China but has spread all over the world to other parts of Asia, West Africa, and the Caribbean during the spice trade. Here are 7 health benefits of ginger. 1. Ginger may quell the feelings of nausea and vomiting. A Brigham Young University study conducted experiments that simulated motion sickness. He then administered ginger to participants. 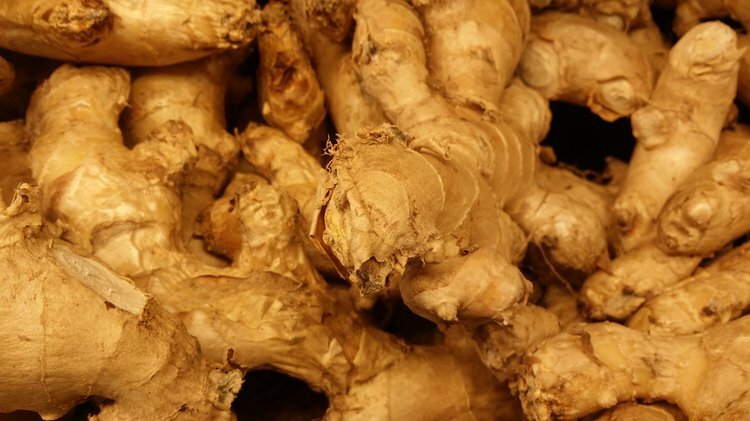 The result: those that consumed ginger exhibited no vomiting and minimal nausea compared to those that did not consume ginger. 2. Ginger may help alleviate suppressed menstruation. Ginger contains antispasmodic properties that stimulate menstruation in women who exhibit suppressed menstrual cycles or who lack them entirely (a condition known as amenorrhea). 3. Ginger may help ease your sore throat. Ginger stimulates the salivary glands, which may help during times of congestion and sore throat. 4. Ginger can serve as a detoxifying cleanser. Ginger stimulates the production of sweat. This facilitates removal of wastes through the skin and increases general circulation. 5. Ginger could decrease the risk of constipation. Yet-undiscovered compounds in ginger may stimulate bowel movements and relieve constipation. 6. Ginger may help prevent urinary tract infections. Ginger’s ability to enhance the regular flow of urine means that it may help ward off urinary tract infections, as well. 7. Ginger can help prevent and fight kidney stones. Dr. Koji Yamoda from Tokyo showed a correlation between consumption of ginger and the treatment and prevention of kidney stones.